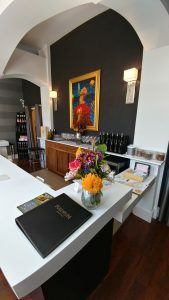 Our second clue: The tasting room menu featured ten offerings – one Petite Sirah, one Chardonnay, one dry Gewurztraminer, one Sauvignon Blanc, and five Pinot Noirs clustered at the top of the list. Pinot is indeed Fulcrum’s specialty, a fact of which owner and winemaker, David Rossi, is quite proud. A dozen years ago, when Rossi made the decision to form Fulcrum, his dream was bigger than to be just another winery vying for attention in the crowded Sonoma-Napa vinescape. “We were looking to have a voice, something to say, if that isn’t too hoity-toity. We wanted to find our own niche, our own identity.” That identity emerged through Pinot Noir. Making a Pinot in Sonoma County is hardly unusual, of course, but there is one aspect of Rossi’s bio tht is truly unique. He lives in New Jersey and operates the business side of Fulcrum from there. He flies into California in August during harvest time to make the wines and periodically at other times of the year as the need arises. His work done out west, he returns home to the Jersey Shore where he then makes sales calls around the East Coast hoping to place orders for the 1,200 cases that Fulcrum and its sister label On Point make in a year. “I’m winemaker, owner, and chief cook and bottle washer. I do sales. I do the taxes. I do everything,” he said not in a boasting way but rather as an expression of entrepreneurial vigor. There is a lot that has to be done when you run a winery, and with a small staff Rossi often delegates himself to step up and do it. Seated at a corner window table in the small, airy tasting room – Rossi and his wife designed it – we got a chance to sample some of Rossi’s greatest hits from his 2014 and 2015 Pinot Noir albums. One of our favorites was the Fulcrum 2015 Donnelly Creek Vineyard, Anderson Valley. Rossi’s winemaking goal is “to make a balanced, elegant Pinot using the riper, juicier fruit of California.” We thought he hit this balance point just right here—a fulcrum is the hinge point on a lever, the center of a teeter-totter—delivering a flavorful Pinot with smoothness and depth. The Eagles’ “Peaceful Easy Feeling” happened to come on the sound system when we were tasting, and the song seemed to capture the feeling the wine conveyed. The first vintage made by Fulcrum, in 2006, came from Anderson Valley, so Rossi clearly has a feel for what to do with the grapes from this area. Another hit for us was the Fulcrum 2014 Landy Vineyard, Russian River Valley Pinot Noir. There were only three bottles of this vintage left in the store. We took one home with us, and the 2014 has since been taken off the menu. Which means that if you go to Fulcrum you will have to make do with the 2015 Landy Vineyard, but if it is anything like the 2014, you’ll be in fine shape. It was delicious.